It was just earlier this week that the crew of STS-107 interrupted their science work on the 17th anniversary of the Challenger disaster to remember their fallen comrades. They honored not only on the seven Challenger astronauts, but also the three who were killed by a fire in their Apollo spacecraft at the pad Jan. 27, 1967. 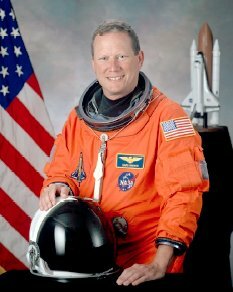 Rick Husband, 45, was a colonel in the U.S. Air Force, a test pilot and veteran of one spaceflight. He served as commander for STS-107. As commander, Husband was responsible for the overall conduct of the mission. Born July 12, 1957, in Amarillo, Texas. Husband was married and had two children. He enjoyed singing, water and snow skiing, cycling, and spending time with his family. After graduation from Texas Tech University in May 1980, Husband was commissioned a second lieutenant in the USAF and attended pilot training at Vance Air Force Base (AFB), Oklahoma. He graduated in October 1981, and was assigned to F-4 training at Homestead AFB, Florida. After completion of F-4 training in September 1982, Husband was assigned to Moody AFB, Georgia flying the F-4E. From September to November 1985, he attended F-4 Instructor School at Homestead AFB and was assigned as an F-4E instructor pilot and academic instructor at George AFB, California in December 1985. In December 1987, Husband was assigned to Edwards AFB, California, where he attended the USAF Test Pilot School. Upon completion of Test Pilot School, Husband served as a test pilot flying the F-4 and all five models of the F-15. In the F-15 Combined Test Force, Husband was the program manager for the Pratt & Whitney F100-PW-229 increased performance engine, and also served as the F-15 Aerial Demonstration Pilot. In June 1992, Husband was assigned to the Aircraft and Armament Evaluation Establishment at Boscombe Down, England, as an exchange test pilot with the Royal Air Force. At Boscombe Down, Husband was the Tornado GR1 and GR4 Project Pilot and served as a test pilot in the Hawk, Hunter, Buccaneer, Jet Provost, Tucano, and Harvard. He has logged over 3800 hours of flight time in more than 40 different types of aircraft. Husband was selected as an astronaut candidate by NASA in December 1994. He reported to the Johnson Space Center in March 1995 to begin a year of training and evaluation. Upon completion of training, Husband was named the Astronaut Office representative for Advanced Projects at Johnson Space Center, working on Space Shuttle Upgrades, the Crew Return Vehicle (CRV) and studies to return to the Moon and travel to Mars. Most recently, he served as Chief of Safety for the Astronaut Office. He flew as pilot on STS-96 in 1999. Previous to STS-107 mission he has logged more than 235 hours in space. William C. McCool, 41, was a commander in the U.S. Navy, and a former test pilot. 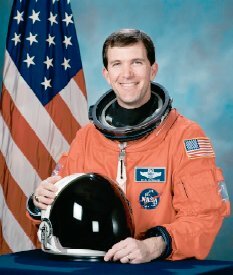 He served as pilot for STS-107. Born September 23, 1961 in San Diego, California. McCool was married with no children. He enjoyed running, mountain biking, back country hiking/camping, swimming, playing guitar, and chess. McCool completed flight training in August 1986 and was assigned to Tactical Electronic Warfare Squadron 129 at Whidbey Island, Washington, for initial EA-6B Prowler training. His first operational tour was with Tactical Electronic Warfare Squadron 133, where he made two deployments aboard USS CORAL SEA (CV-43) to the Mediterranean Sea, and received designation as a wing qualified landing signal officer (LSO). In November 1989, he was selected for the Naval Postgraduate School/Test Pilot School (TPS) Cooperative Education Program. After graduating from TPS in June 1992, he worked as TA-4J and EA-6B test pilot in Flight Systems Department of Strike Aircraft Test Directorate at Patuxent River, Maryland. He was responsible for the management and conduct of a wide variety of projects, ranging from airframe fatigue life studies to numerous avionics upgrades. His primary efforts, however, were dedicated to flight test of the Advanced Capability (ADVCAP) EA-6B. Following his Patuxent River tour, McCool returned to Whidbey Island, and was assigned to Tactical Electronic Warfare Squadron 132 aboard USS ENTERPRISE (CVN-65). He served as Administrative and Operations Officer with the squadron through their work-up cycle, receiving notice of NASA selection while embarked on ENTERPRISE for her final pre-deployment at-sea period. McCool had over 2,800 hours flight experience in 24 aircraft and over 400 carrier arrestments. Selected by NASA in April 1996, McCool reported to the Johnson Space Center in August 1996. He completed two years of training and evaluation, and was qualified for flight assignment as a pilot. Initially assigned to the Computer Support Branch, McCool also served as Technical Assistant to the Director of Flight Crew Operations, and worked Shuttle cockpit upgrade issues for the Astronaut Office. McCool made his first spaceflight on STS-107. Michael P. Anderson, 43, was a lieutenant colonel in the U.S. Air Force, was a former instructor pilot and tactical officer, and a veteran of one spaceflight. 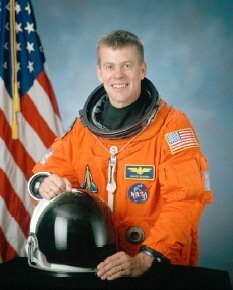 He served as Payload Commander and Mission Specialist 3 for STS-107. As payload commander he was responsible for the success (management) of the science mission aboard STS-107. Born December 25, 1959, in Plattsburgh, New York. Considered Spokane, Washington, to be his hometown. Married. He enjoyed photography, chess, computers, and tennis. Anderson graduated form the University of Washington in 1981 and was commissioned a second lieutenant. After completing a year of technical training at Keesler AFB Mississippi he was assigned to Randolph AFB Texas. At Randolph he served as Chief of Communication Maintenance for the 2015 Communication Squadron and later as Director of Information System Maintenance for the 1920 Information System Group. In 1986 he was selected to attend Undergraduate Pilot Training at Vance AFB, Oklahoma. Upon graduation he was assigned to the 2nd Airborne Command and Control Squadron, Offutt AFB Nebraska as an EC 135 pilot, flying the Strategic Air Commands airborne command post code-named "Looking Glass". From January 1991 to September 1992 he served as an aircraft commander and instructor pilot in the 920th Air Refueling Squadron, Wurtsmith AFB Michigan. From September 1992 to February 1995 he was assigned as an instructor pilot and tactics officer in the 380 Air Refueling Wing, Plattsburgh AFB New York. Anderson has logged over 3000 hours in various models of the KC-135 and the T-38A aircraft. Selected by NASA in December 1994, Anderson reported to the Johnson Space Center in March 1995. He completed a year of training and evaluation, and was qualified for flight crew assignment as a mission specialist. Anderson was initially assigned technical duties in the Flight Support Branch of the Astronaut Office. Most recently, he flew on the crew of STS-89. In completing his first space flight Anderson logged over 211 hours in space previous to STS-107. STS-89 (January 22-31, 1998), was the eighth Shuttle-Mir docking mission during which the crew transferred more than 9,000 pounds of scientific equipment, logistical hardware and water from Space Shuttle Endeavour to Mir. In the fifth and last exchange of a U.S. astronaut, STS-89 delivered Andy Thomas to Mir and returned with David Wolf. Mission duration was 8 days, 19 hours and 47 seconds, traveling 3.6 million miles in 138 orbits of the Earth. David M. Brown, 46, was a captain in the U.S. Navy, a naval aviator and flight surgeon. He served as Mission Specialist 1 for STS-107. Born April 16, 1956 in Arlington, Virginia. Brown was single. He enjoyed flying and bicycle touring. Was also a four year collegiate varsity gymnast. While in college he performed in the Circus Kingdom as an acrobat, 7 foot unicyclist and stilt walker. His parents, Paul and Dorothy Brown, reside in Washington, Virginia. Brown joined the Navy after his internship at the Medical University of South Carolina. Upon completion of flight surgeon training in 1984, he reported to the Navy Branch Hospital in Adak, Alaska, as Director of Medical Services. He was then assigned to Carrier Airwing Fifteen which deployed aboard the USS Carl Vinson in the western Pacific. In 1988, he was the only flight surgeon in a ten year period to be chosen for pilot training. He was ultimately designated a naval aviator in 1990 in Beeville, Texas, ranking number one in his class. Brown was then sent for training and carrier qualification in the A-6E Intruder. In 1991 he reported to the Naval Strike Warfare Center in Fallon, Nevada, where he served as a Strike Leader Attack Training Syllabus Instructor and a Contingency Cell Planning Officer. Additionally, he was qualified in the F-18 Hornet and deployed from Japan in 1992 aboard the USS Independence flying the A-6E with VA-115. In 1995, he reported to the U.S. Naval Test Pilot School as their flight surgeon where he also flew the T-38 Talon. Brown has logged over 2,700 flight hours with 1,700 in high performance military aircraft. He was qualified as first pilot in NASA T-38 aircraft. Selected by NASA in April 1996, Brown reported to the Johnson Space Center in August 1996. Having completed two years of training and evaluation, he is eligible for flight assignment as a mission specialist. He was initially assigned to support payload development for the International Space Station, followed by the astronaut support team responsible for orbiter cockpit setup, crew strap-in, and landing recovery. 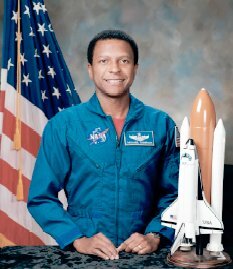 Brown made his first spaceflight on STS-107. Kalpana Chawla, 41, was an aerospace engineer and an FAA Certified Flight Instructor. Chawla served as Flight Engineer and Mission Specialist 2 for STS-107. As a member of the Red Team, Chawla, with CDR Rick Husband, was responsible for maneuvering Columbia as part of several experiments in the shuttle's payload bay. Born in Karnal, India. Kalpana Chawla enjoyed flying, hiking, back-packing, and reading. She holded Certificated Flight Instructor's license with airplane and glider ratings, Commercial Pilot's licenses for single- and multi-engine land and seaplanes, and Gliders, and instrument rating for airplanes. She enjoyed flying aerobatics and tail-wheel airplanes. In 1988, Kalpana Chawla started work at NASA Ames Research Center in the area of powered-lift computational fluid dynamics. Her research concentrated on simulation of complex air flows encountered around aircraft such as the Harrier in "ground-effect." Following completion of this project she supported research in mapping of flow solvers to parallel computers, and testing of these solvers by carrying out powered lift computations. In 1993 Kalpana Chawla joined Overset Methods Inc., Los Altos, California, as Vice President and Research Scientist to form a team with other researchers specializing in simulation of moving multiple body problems. She was responsible for development and implementation of efficient techniques to perform aerodynamic optimization. Results of various projects that Kalpana Chawla participated in are documented in technical conference papers and journals. 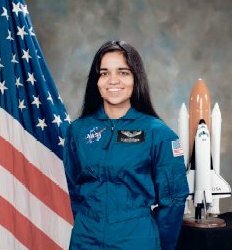 Selected by NASA in December 1994, Kalpana Chawla reported to the Johnson Space Center in March 1995 as an astronaut candidate in the 15th Group of Astronauts. After completing a year of training and evaluation, she was assigned as crew representative to work technical issues for the Astronaut Office EVA/Robotics and Computer Branches. Her assignments included work on development of Robotic Situational Awareness Displays and testing space shuttle control software in the Shuttle Avionics Integration Laboratory. In November, 1996, Kalpana Chawla was assigned as mission specialist and prime robotic arm operator on STS-87 (November 19 to December 5, 1997). STS-87 was the fourth U.S Microgravity Payload flight and focused on experiments designed to study how the weightless environment of space affects various physical processes, and on observations of the Sun's outer atmospheric layers. Two members of the crew performed an EVA (spacewalk) which featured the manual capture of a Spartan satellite, in addition to testing EVA tools and procedures for future Space Station assembly. In completing her first mission, Kalpana Chawla traveled 6.5 million miles in 252 orbits of the Earth and logged 376 hours and 34 minutes in space. In January, 1998, Kalpana Chawla was assigned as crew representative for shuttle and station flight crew equipment. Subsequently, she was assigned as the lead for Astronaut Office's Crew Systems and Habitability section. 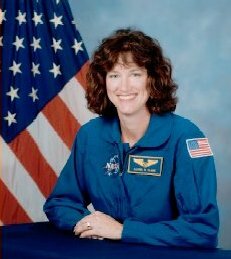 Laurel Clark, 41, was a commander (captain-select) in the U.S. Navy and a naval flight surgeon, and was Mission Specialist 4 on STS-107. Born in Iowa, but considered Racine, Wisconsin, to be her hometown. She was married with one child. She enjoyed scuba diving, hiking, camping, biking, parachuting, flying, traveling. Her parents reside in New Mexico. During medical school she did active duty training with the Diving Medicine Department at the Naval Experimental Diving Unit in March 1987. After completing medical school, Dr. Clark underwent postgraduate Medical education in Pediatrics from 1987-1988 at Naval Hospital Bethesda, Maryland. The following year she completed Navy undersea medical officer training at the Naval Undersea Medical Institute in Groton Connecticut and diving medical officer training at the Naval Diving and Salvage Training Center in Panama City, Florida, and was designated a Radiation Health Officer and Undersea Medical Officer. She was then assigned as the Submarine Squadron Fourteen Medical Department Head in Holy Loch Scotland. During that assignment she dove with US Navy divers and Naval Special Warfare Unit Two Seals and performed numerous medical evacuations from US submarines. After two years of operational experience she was designated as a Naval Submarine Medical Officer and Diving Medical Officer. She underwent 6 months of aeromedical training at the Naval Aerospace Medical Institute in Pensacola, Florida and was designated as a Naval Flight Surgeon. She was stationed at MCAS Yuma, Arizona and assigned as Flight Surgeon for a Marine Corps AV-8B Night Attack Harrier Squadron (VMA 211). She made numerous deployments, including one overseas to the Western Pacific, practiced medicine in austere environments, and flew on multiple aircraft. Her squadron won the Marine Attack Squadron of the year for its successful deployment. She was then assigned as the Group Flight Surgeon for the Marine Aircraft Group (MAG 13). Prior to her selection as an astronaut candidate she served as a Flight Surgeon for the Naval Flight Officer advanced training squadron (VT-86) in Pensacola, Florida. LCDR Clark is Board Certified by the National Board of Medical Examiners and holds a Wisconsin Medical License. Her military qualifications include Radiation Health Officer, Undersea Medical Officer, Diving Medical Officer, Submarine Medical Officer, and Naval Flight Surgeon. She is a Basic Life Support Instructor, Advanced Cardiac Life Support Provider, Advanced Trauma Life Support Provider, and Hyperbaric Chamber Advisor. Selected by NASA in April 1996, Dr. Clark reported to the Johnson Space Center in August 1996. After completing two years of training and evaluation, she was qualified for flight assignment as a mission specialist. From July 1997 to August 2000 Dr. Clark worked in the Astronaut Office Payloads/Habitability Branch. Clark was making her first spaceflight on STS-107. 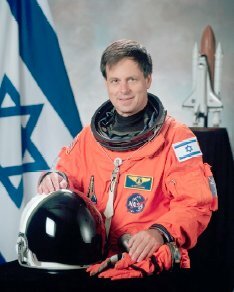 Ilan Ramon, 48, a colonel in the Israeli Air Force, was a fighter pilot and was the only payload specialist on STS-107. Born June 20,1954 in Tel Aviv, Israel. Was married to Rona and had four children. He enjoyed snow skiing, squash. His parents reside in Beer Sheva, Israel. Colonel Ramon accumulated over 3,000 flight hours on the A-4, Mirage III-C, and F-4, and over 1,000 flight hours on the F-16. Ramon was selected as a Payload Specialist by the Israeli Air Force in 1997 and approved by NASA in 1998. He reported for training at the NASA Johnson Space Center in Houston in July 1998 and was making his first spaceflight. I was in the newsroom when it happened this morning and was watching all the live feeds. I couldn't believe what I was seeing at first. I'm glad I don't cover stories like this. My thoughts are with all their families. May God Bless and keep them, and may we not forget to honor their memories. First time I've cried in a while. Those who fall in the pursuit of knowledge are truly world citizens, and heroes of peace. I suggest to all concerned that an international day of mourning is not unreasonable. God bless them all, for they gave the last full measure of devotion towards understanding our world, and our universe.